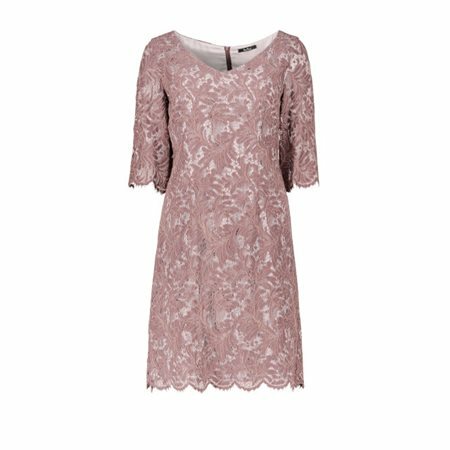 This pretty mocha coloured lace dress by Vera Mont has been beautifully tailored into a fitted finish to celebrate your silhouette. The dress has been designed using a soft lace overlay that sits over a satin underdress. The dress has a V neckline and elbow length sleeves that have been finished off perfectly with a lace scalloped edge. The dress closes at the back with a concealed zip. We think this elegant dress would be a great choice for a special occasion, wear it with our mocha coloured sheer stole.